Many top-level footballers coming to the end of their career often worry about the direction of their post-playing lives. But not Quinton Fortune. For the ex-Manchester United and South Africa midfielder is quite clear about his future. Fortune, 35, is desperate to become the Bafana Bafana coach and help his nation become the first African side to win the World Cup. But he realises a glittering career, which saw him earn 53 international caps and a Premier League title winners' medal for United, is not enough to prove his coaching credentials. So he picked up the phone to ask his former Old Trafford boss Sir Alex Ferguson for his help. The Scot has allowed Fortune to go back to United's Carrington training ground and his former player is now working towards his coaching badges ahead of starting his climb up the managerial ladder. Ferguson's stellar coaching career began in the lower reaches of the Scottish league before leading his nation at the 1986 World Cup - and Fortune plans to follow the same path. He has been studying Ferguson and the Premier League club's reserve-team boss Warren Joyce on the practice pitches to pick up vital tips. On completion of his badges, Fortune aims to find work in England, where he has lived since 1991, before moving back to South Africa. "That's the plan," he told BBC Sport. "I want to gain as much knowledge and information as I can while I'm at United. Then I will try to get work in this country and move up the ladder. "But to be South Africa national team coach is my dream." Fortune saw his nation become the first African country to host a World Cup finals as the 2010 tournament created a lasting legacy - both on and off the field - for the continent. With Ghana agonisingly close to becoming the first African team to reach a World Cup semi-final and players like Samuel Eto'o and Didier Drogba being among the most recognisable footballers on the planet, the stock of African football continues to rise. But the continent will continue to lag behind Europe and South America as a traditional superpower of the international game until a victorious African captain lifts the World Cup. Fortune, who played in the 1998 and 2002 World Cup finals, is convinced he will see that happen in his lifetime. "Yes, absolutely. I believe that," he insists. "More African players are playing at top clubs in Europe and the world doesn't seem that big anymore. The organisation from grassroots to the top is getting better too." Improved organisation means more South African youngsters than ever are playing and Fortune believes it can only lead to a strong national side in the future. But he admits the current crop does not look likely to eclipse the success of his 'golden' generation. 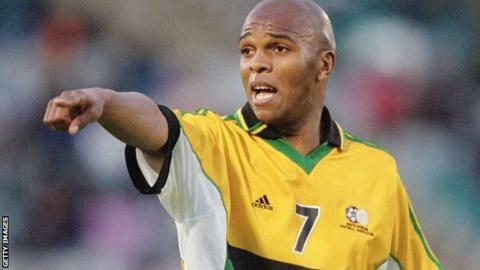 Fortune, along with the likes of ex-Leeds United captain Lucas Radebe and former Blackburn Rovers striker Benni McCarthy, helped the 1996 Africa Cup of Nations champions qualify for consecutive World Cup finals around the turn of the Millennium. Part of the problem, he believes, is few South Africans are plying their trade with top European clubs. Only Everton midfielder Steven Pienaar, who recently retired from Bafana duty, is currently playing in the Premier League and Fortune says he has not seen any home-based player who could take the English top-flight by storm. "At the moment I haven't seen anyone who I think 'yes he's the one'," he admits. "I'm still searching for that one. But I'm hoping we can find another Steven Pienaar, Lucas Radebe or Benni McCarthy." Fortune, who still lives in Manchester, has not officially retired as a player and openly admits to be obsessed with football to the point of not being able to "even think about anything else". Yet he refuses to consider playing in England's lower leagues because he insists he does not want to be a barrier to younger players starting out in the game. Instead he has switched his focus to passing on his wealth of experience from the touchline. And Fortune would love nothing more than helping a future Bafana side to rewrite the history he helped create as a player.